Gerber Command II, mint in the box, serial no. A1699S; a companion model to the Mark II. Gerber Command II, mint in the box, serial no. A1699S; a companion model to the Mark II. 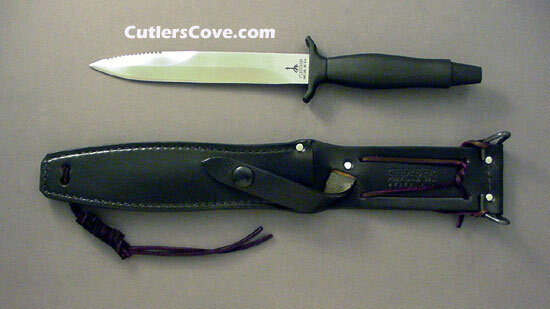 It is 12" overall with a 6-3/4" blade, with serrations on top edge. The significant difference between this knife and the Gerber Mark II is the flat back edge of the knife except for the last three inches near the point, which is sharpened and serrated on both sides out near the tip. The handle is black Armorhide metal. Includes the original black leather sheath with (old style) military utility belt clip. I think they were produced in the early 1980's only. Knife comes in it’s original orange and white box. John Sabol's website THE GERBER Mark II™ KNIFE is highly recommended for more information on the Gerber Mark I and Mark II knives. Remember we buy knives like the one above. Click here for the details.